It’s that time of the year again! We are running Xmas Card workshops again this year and they are already selling out so get booking! 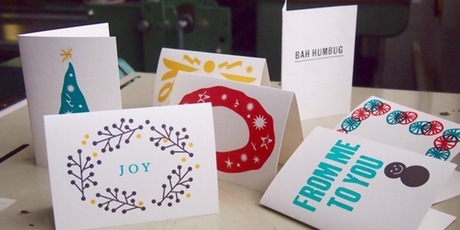 Join us this season at the LCBA studio to print your own set of letterpress printed greeting cards. Letterpress printing is a popular relief printing method that yields a unique and beautiful, crisp impression. Participants will learn the basics of letterpress, which will be put into practice using wood and metal type, and images designed exclusively for the workshops. At the end of the workshop, everyone will take home a set of 15 hand-printed cards, including envelopes. Open to all abilities including beginners, with all tools and materials provided.